Vali in Ramayana was a mighty monkey king who played a crucial role. King Bali was killed by Bhagavan Sri Ram. He was the king of Kishkindha, brother of Sugriva and father of Angada. Once, Lord Brahma was lost in Yoga in the Brahma Sabha on the peak of Mount Meru. A tear happened to fall from his eyes on to the ground. A monkey was born out of it and was named Riksharaja. Brahma advised it to enjoy the roots and fruits of the area and remain near him. Once Riksharaja felt very thirsty and went towards the north of Mount Meru. Here he saw a pool of water. While drinking water from the pool, he saw his reflection in the water. He thought the reflection was an intruder and enemy. He jumped into the water to kill it. When Riksharaja came out of the pool of water he was transformed into a beautiful damsel. Indra, the king of Devas, and Surya, the sun god, happened to come there and they were enamored by the beauty of the damsel. Vali was born to Indra in the damsel. Sugriva was born to Surya in the damsel. After the birth to two sons, Riksharaja got back his original form and took both of his sons to Brahma. Brahma asked the two sons to rule over Kishkindha built by Sage Vishwamitra. Vali, the elder brother, started ruling over the monkeys from Kishkindha. He married Tara, daughter of Vanara king Susena. Sugriva married Ruma. Ravana who knew about a extraordinary boon that Vali possessed once attacked him from behind. Vali had got a boon that he will get half the strength of anyone who attacked him. Vali who was in meditation tied Ravana to his long tail. He then flew across the four oceans hit Ravana on to rocks and trees. Vali finally released the humiliated Ravana after he tendered an apology for attacking from behind. Vali once killed Demon Dundubhi and threw his body far away. It fell in the hermitage of Matanga Rishi situated on the Rishyamukha Hill. An angry Rishi curse Bali that if he ever entered the Rishyamukha Hill he would die. After the curse, King Vali avoided the region of the Rishyamukha Hill. Once when Vali went to fight Demon Mayavi, son of Dundhubhi, he asked Sugriva to wait outside the cave till he returned after defeating the enemy. Sugriva waited for days and there was no sign of Vali or Mayavi. Then one day blood started flowing out of the cave and he also heard the roar of Mayavi. He did not see Sugriva or any call from him. Sugriva surmised that his brother had been killed by Mayavi. To avoid the demon coming out, he blocked the mouth of the cave with a huge boulder. Returning to Kishkindha he crowned himself as the king. Vali had actually killed the demon and was so tired that he fell asleep. Angry with Sugriva for closing the cave and crowning himself king, he exiled his brother and forcibly married Sugriva’s wife Ruma. Sugriva, accompanied by Hanuman, sought refuge in the Rishyamukha Hill. When Sri Ram and Lakshman came there in search of Mata Sita, Sugriva became their friend. They promised to help each other. As per a plan etched, Sugriva challenged Vali and during the fight, Sri Ram was to kill Vali using arrows. But both the brothers looked alike in the first duel. Vali easily overpowered Sugriva and Rama could not shoot his arrows as he could not distinguish between Vali and Sugriva. In the next duel, Sugriva worn and garland made of gajapushipi flowers. Sugriva challenges Vali after reaching Kishkinda. Tara, wife of Vali, tries to stop her husband by stating that Sugriva has now a powerful friend in Rama. She asks Vali to make peace with Sugriva. She advised Vali to have a good friendship with Rama as it will be for the good of all. Vali did not listen to his wife’s advice. Instead he reprimanded her and told her that Rama would not do any Adharma. Vali soon went into to fight with Sugriva and during the course of the fist fight, Rama shot a large arrow the hit the chest of Vali and he fell down on the ground. 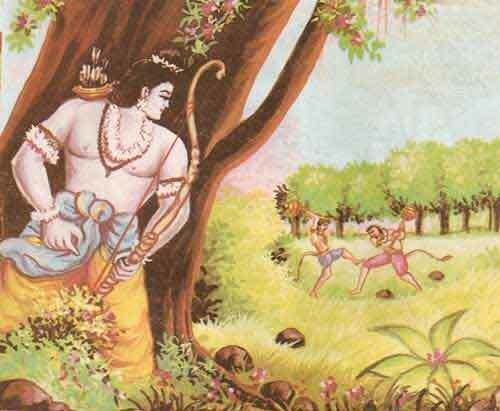 Why Rama Killed Vali By Hiding Behind Trees? Vali, who was himself extraordinarily strong, had secured a boon to the effect that he would gain, in addition, half the strength of any person fought him face to face. He got this boon from his father Indra. If Rama was to face Vali directly, then Vali will get half the strength of Rama and this will make him imperishable. Vali, in his dying moments, initially reproached Rama for slaying him from behind seven palm trees. He told Rama that with this act of was not Dharma. But Rama tells Vali that the committed the wicked crime of marrying Sugriva’s wife. As a king Vali was supposed to protect the weak and unprotected but he committed adultery by marrying Sugriva’s wife. This act of the king sends wrong signals to his subjects. Respecting and protecting women is of prime importance and a king should never ignore it. Rama killed Vali to uphold Dharma and to protect women in Kishkinda. Vali then realizes his mistakes and the greatness of Rama as the upholder of dharma and sought his forgiveness and protection to his dear son, Angada. 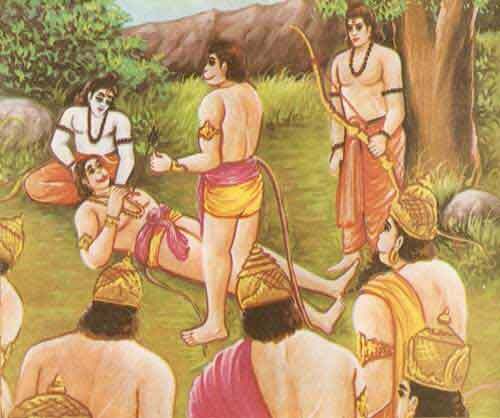 Rama with great respect and kindness to Bali accepted his last will.